The flavors of ginger, garlic, and golden brown sesame seeds are locked inside tender tofu steaks that are seared over high heat until crispy. 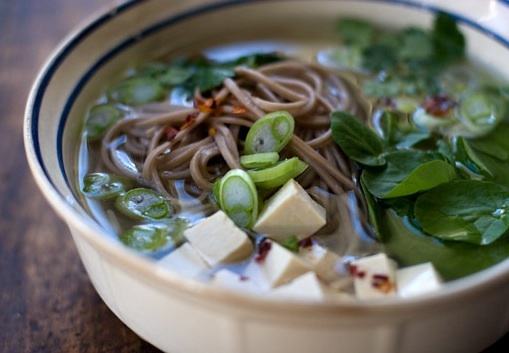 If you prefer a stronger miso flavor, use a dark brown or red miso. It's preferable to leave the tofu to marinate overnight in the refrigerator. Bok choy is also called Chinese mustard cabbage, resembling a cross between celery and Swiss chard. While the stem is rather sweet, the leaves have a pleasant bitter flavor. If you can find baby bok choy, use it for this recipe; the cooking time will be reduced by almost half. You may quarter the whole heads of baby bok choy lengthwise and wilt them. Wilted bok choy is delicious served chilled the following day. Bok choy pairs well with any Asian-inspired dish. Cut the tofu lengthwise into four (1/2-inch-thick) rectangular "steaks," about 4 ounces each. To prepare the Sesame-Miso Marinade: Combine the garlic, ginger, sesame oil, tamari, rice vinegar, brown sugar, sesame seeds, red chili flakes, water, and miso in a food processor bowl fitted with a metal blade. Process until smooth. Place the marinade in a shallow dish, and add the tofu, turning to coat well. 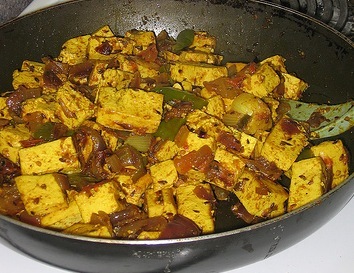 Marinate the tofu for at least 2 hours, preferably overnight, in the refrigerator. Preheat the oven to the lowest setting, about 185°F., to keep the tofu warm while you wilt the bok choy. Spray a large nonstick sauté pan with vegetable oil. Heat over high heat. Remove the tofu from the marinade, allowing the excess liquid to drain. Reserve the marinade. Place the tofu in the hot sauté pan and sear for 2 minutes on each side, or until well browned, turning once. Place the tofu in the warm oven, and prepare the bok choy. To prepare the Wilted Bok Choy: Heat the peanut and sesame oils over moderate heat in a nonstick sauté pan. Add the bok choy, garlic, and ginger and sauté, stirring frequently for 4 minutes, until almost tender. Add the tamari and scallions, and remove from heat. To assemble, place a bed of bok choy on each plate. Arrange a tofu steak over the bok choy, and drizzle with some of the reserved marinade. Sprinkle with sesame seeds. Tofu: Per Serving: calories 80; calories from fat 35; calories from saturated fat 0; protein 9g; carbohydrate 3g; total fat 3.5g; saturated fat 0g; cholesterol 0 mg; sodium 240 mg; 44% calories from fat. Wrap tofu with paper towels and place on a cutting board. Put another cutting board or heavy plate on top to press out liquid. Set aside for 20 minutes. Meanwhile, put honey, tamari, ginger, sesame oil, vinegar, garlic and chile flakes into a small saucepan and bring just to a simmer. Keep warm. Dry drained tofu with paper towels and cut into cubes. Dust very lightly all over with cornstarch or flour. Heat 1 inch of oil in a deep skillet over medium high heat until it reaches 350?F on a deep-fry thermometer. Fry tofu until golden brown, then transfer to a large bowl and toss with 2/3 cup of the warm sauce. Sprinkle with sesame seeds and green onions and toss gently. Serve with remaining sauce for dipping, or drizzle over vegetables on the side. Serve with steamed bok choy or broccoli, sautéed watercress or eggplant, and brown rice. This is extremely hot chili! Heat some oil in a pan, throw in some cumin seeds and let them pop, then add 3 jalapeño peppers cut, length-wise, into sixths and 3 chili peppers cut, width-wise, into small bits. Let them fry for about a minute and add a large diced red onion. Fry everything until the onion becomes soft and translucent. Add one or two diced tomatoes, and the following spices: chili powder, garam masala, and turmeric. Let the spices cook for a bit before adding aout 700 grams of tofu. Cook everything together for about 5-10 minutes. Serve over rice or with bland daal poured on top. 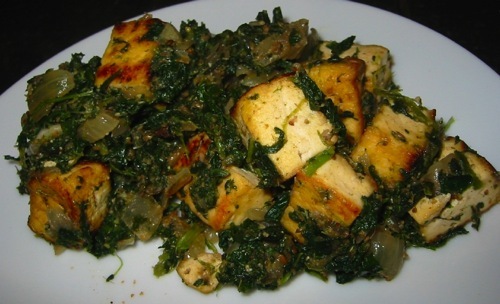 Saag Paneer is an Indian dish with spinach and fried cheese. 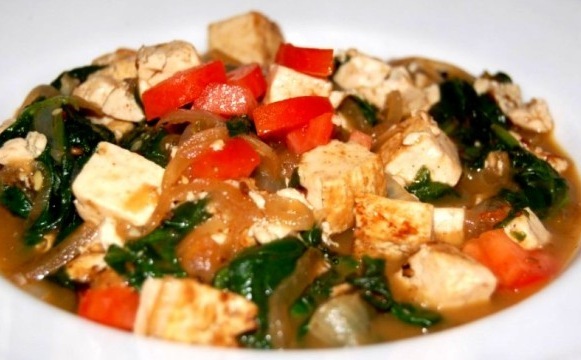 If you replace the cheese with firm tofu, you make "Saag Tofu". Here are 3 versions: Katie Haslett's Saag Tofu, Melody's "Saag Paneer / Thai Stew" with coconut milk, and Mark Foy's Saag Paneer with fresh ginger juice. Heat 1 tsp of oil over medium heat in a large skillet. Saute tofu until cubes are brown on all sides, and then set tofu aside. Add another tsp of oil to the pan and sauté onion, garlic, jalapeño, and ginger until they're soft (about 5 min). Add mustard seeds and cook another minute, or until seeds start popping. Stir in the remaining spices, spinach, water, and lemon juice, cover, and let simmer on medium-low for 20 min. Add the yogurt and tofu and let cook another minute or so, until tofu reheats. 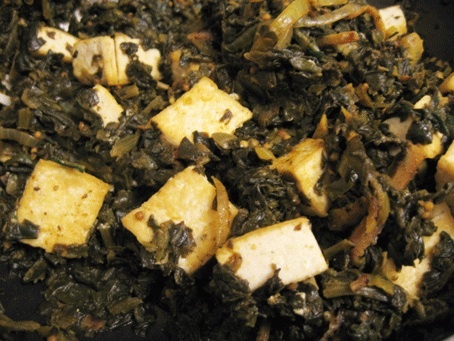 Based on the Indian dish Saag Paneer, this uses tofu cubes instead of fresh cheese cubes. Cut tofu into 3/4-inch cubes. Heat a large skillet (works best if it is non-stick), and when it is hot, add the oil and then the tofu. Saute, flipping the little tofu cubes occasionally, so they get a little crispy and brown on all sides. gets braised with this "sauce". It should cook in quickly. Turn off heat, and set aside for later in the recipe. While tofu is cooking, defrost spinach, squeeze all the liquid out, and chop. Set aside for use later in the recipe. Heat a thick bottomed pot over medium-high heat and add oil. Add onion and garlic and saute for about 14 minutes. Add the remaining ingredients except the ginger and salt, and cook for about 3 minutes. Add the defrosted, squeezed, and chopped spinach, the browned tofu, ginger juice, and salt, and cook for about 5 minutes. Use some chopped collard greens in place of some of the spinach. To make fresh ginger juice, take fresh whole ginger root pieces and grate them. (Asian groceries often sell purpose-made ginger graters; you can also find microplane graters specifically for ginger; a regular fine grater can also be used.) Then press the juice out of the pulp (a fine strainer works well for this). Alternatively, run ginger root through a juice (as you would carrots). If ginger juice is to be stored for more than 5 days, add some lemon juice to the ginger juice to help it keep. Place it in a sealed bottle in the refrigerator. It should keep about 5 days without lemon juice, and about 10 days with lemon juice (or something acidic). A half cup of fresh whole ginger root pieces makes about 3-4 tablespoons of ginger juice. A teaspoon of dried, powdered ginger can be used in place of a tablespoon of fresh ginger juice, but the flavor will not be the same. 1/2 Vegetable; 0 Fruit; 2 Fat.